WASHINGTON (AP) — Secretary of State John Kerry called for patience despite widespread frustration with the recent failure of negotiations between six world powers and Iran over its disputed nuclear program and growing fears of Tehran developing a weapon of mass destruction. Testifying Thursday before the Senate Foreign Relations Committee, Kerry said he was disappointed by the inconclusive talks in Kazakhstan earlier this month, but insisted that a diplomatic resolution is still the best option. The international community fears Tehran is developing a nuclear weapon; Iran insists its work is for peaceful purposes. Congress has repeatedly pressed for tough sanctions on Iran, convinced that undermining its economy and oil revenue will thwart its nuclear program. Kerry, in urging patience, highlighted uncertainty in Tehran, with a power struggle two months ahead of June elections, and said he did not expect “anything dramatic” in the next few weeks. “We don’t need to spin this up at this point in time,” Kerry told the panel. The secretary reiterated President Barack Obama’s past statements that the United States will ensure that Iran does not get a nuclear weapon. Committee Chairman Bob Menendez, D-N.J., and other lawmakers have succeeded in securing several rounds of penalties on Iran’s banking and energy sectors. Sen. Mark Kirk, R-Ill., a top sponsor of sanctions legislation since his arrival in the Senate in January 2011, is crafting a bill that would target regime officials who violate human rights with travel bans and seizure of assets, and essentially impose a commercial and financial embargo on Iran. It also would basically impose a tough arms embargo on Iran, its proxies in Gaza and southern Lebanon, as well as North Korea, Syria and Sudan. The measure would close loopholes in current law related to Iran’s access to foreign exchange reserves. Current sanctions have undercut the Iranian economy, causing high unemployment and inflation, while daily oil production and the value of the country’s currency, the rial, have dropped. Kirk’s latest effort would mark the fifth time since June 2010 that Congress has slapped penalties on Iran. Any penalties are certain to draw strong bipartisan support as lawmakers, fearful of Iran’s ambitions and worried about its threat to Israel, have overwhelmingly embraced past sanctions legislation. Menendez reminded Kerry that the diplomatic window with Iran is closing, giving impetus to the congressional moves for more sanctions. 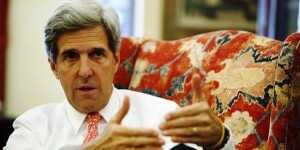 Kerry said the State Department would like to work with Congress on the timing of any new initiatives. Kerry, the former Massachusetts senator, was testifying for the first time since his confirmation before the panel that he once chaired. He described sitting on the other side of the dais as surreal.